Banks will need to open up if they wish to retain their role as financial intermediaries. Open Banking means financial institutions will need to offer their clients customized, innovative solutions. Anke Bridge Haux, Head of Digital Solutions & Delivery, acknowledges that this calls for strategic foresight, not only on the technology front but also in terms of business models and market positioning. Why should banks open up? What are the opportunities and risks involved? How do financial experts see the implications of the Payment Services Directive (PSD2): overstated, or a disruptive innovation? Last but not least, do Switzerland's long-standing banking traditions still matter in the era of digital transformation? These were some of the subjects discussed at the 2018 FinTech forum on digital transformation, entitled "Open Banking: Paradigm Shift." 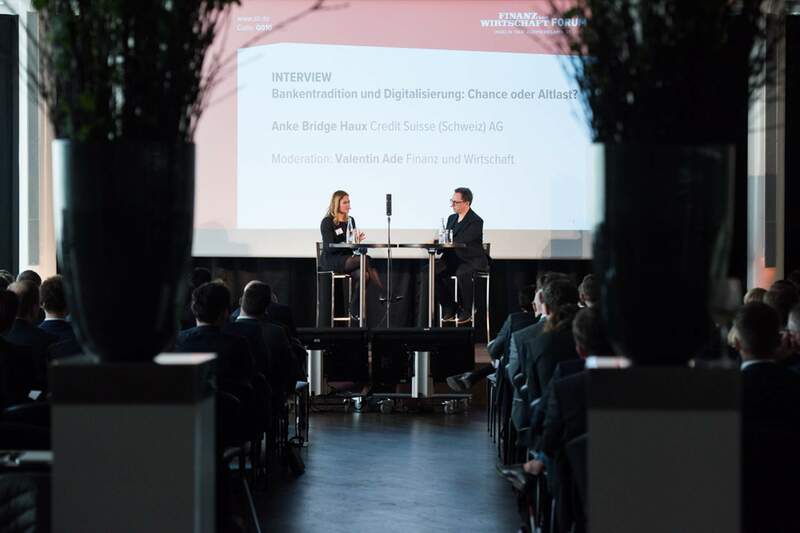 This is the fourth time the event has been held by Finanz und Wirtschaft with Credit Suisse as a main partner. 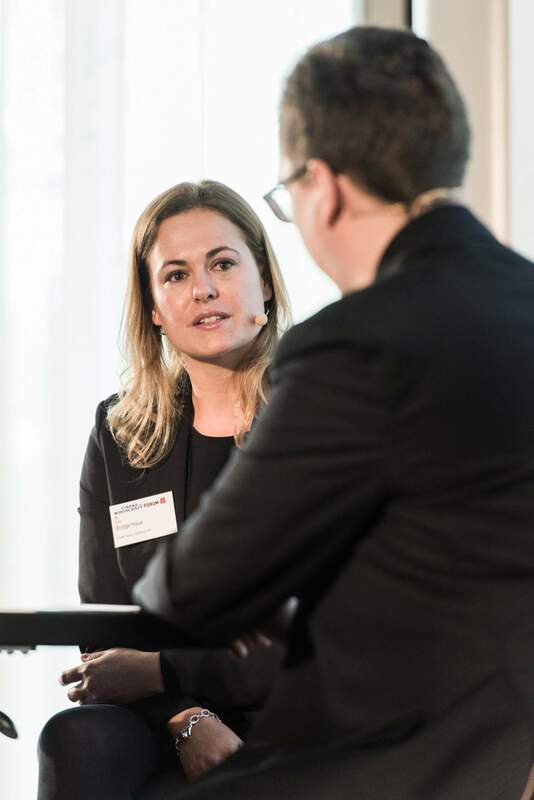 Anke Bridge Haux, Head of Digital Solutions & Delivery and responsible for digitalization initiatives for the Swiss business, shared her perspectives with us shortly before addressing the event. "Open Banking" is the buzzword of the moment: Programming interfaces are crucial to data traffic in the banking world of tomorrow. How important is this development at Credit Suisse? Anke Bridge Haux: Open Banking will accelerate innovation in favor of the end-user. This will create opportunities for banks with a strategic vision of their role within the broader ecosystem. At the same time, Open Banking may pose a threat to banks that don't have a concrete strategy. Credit Suisse is an active supporter of Open Banking. For example, we are working as part of the Corporate API (application programming interface) project led by Swiss Fintech Innovations (SFTI) and welcome the collaboration with the FinTech community as a way of developing our Open Banking approach. Our aim is therefore to proactively incorporate Open Banking into our strategy and align ourselves with the requirements of the supervisory authorities. 2018 is going to be a year of partnerships. Banks will continue to open up, and technical standards will play an important role in this process, since they are a catalyst to further developments in Open Banking and a prerequisite for exploiting this potential from a strategy perspective. In terms of technology, 2017 was described as the "year of digitalization" for Credit Suisse in Switzerland. How do you see it? Very positively – we were successful in launching a large number of new digital features and were therefore able to turn our ambition into reality. For instance, digital account opening is now possible for private clients from around 50 countries provided they are domiciled in Switzerland. Since the fall, start-ups have been able to open their capital contribution account online. All processes are free of media breaks – meaning the account opening process can be done on a completely paperless basis and in just a few minutes. The numbers speak for themselves: 80 percent of accounts are now opened using the new digital process. What's more, we achieved two milestones with the launch of Credit Suisse Direct Business and Credit Suisse Direct. Online Banking for private clients was revamped to bring it into line with the successful Mobile Banking offer, making it much more user-friendly and intuitive. And since last fall our corporate clients have had access to Online Leasing and Multi-Banking – two solutions that are unique on the Swiss market. How important are these developments for the bank overall? Innovative projects are, of course, being developed by other business areas as well as by Digital Solutions & Delivery. For example, our colleagues from Products & Investment Services scored a major success with the launch of "Digipigi": With well over 10,000 packages delivered in just four months – including a large number of new clients – even our high expectations were exceeded, culminating in delivery bottlenecks. In addition, Credit Suisse co-launched TWINT – initially with six banks – in mid-April 2017; and 65 banks now offer the TWINT mobile payment solution to their clients. At more than 700,000 users and up to 15,000 new registered users per week, the figures speak for themselves. That's an impressive benchmark: will it be possible to maintain – never mind increase – the rate of growth this year? Last year's main focus for us was on coming up with innovative new solutions for our basic digital services and basic offerings. In 2018 we are building on the foundations laid last year, and are steadily expanding our offer. To give you a specific example, the digital account opening process for corporate clients is due to go live in the next few weeks. Added to that, we'll be launching an online credit function on the corporate clients portal in the next few days: This enables applicants to find out in just a few minutes whether we are prepared to grant them a loan and, if so, on what terms. The same applies to online lombard loans, which we're also hoping to launch for private clients this year. What other features can our clients look forward to? I think our eTax solution will be very well received. This new feature makes it significantly easier for many of our clients to complete their tax declaration, because the tax-relevant items are automatically imported into their online tax return. In addition, we're putting a lot of energy into developing client chatbots. SwissSign Group was set up in early March to provide the SwissID service, with Credit Suisse as one of the backers. But this isn't the first time an attempt has been made to establish a digital identity in Switzerland, so why should it work now? It marks another important step toward the implementation of a digital identity system in Switzerland. I'm convinced it will work this time, because with SwissID we've created a widely accepted digital identity with extensive potential applications. Backers include banks and insurance companies as well as major government-related organizations. A further eight partners have been added to the existing nine partners since the announcement of the Memorandum of Understanding on Swiss Digital Day. Credit Suisse has been a backer of the project since the outset. To what extent will SwissID make online life easier? SwissID will enable users to move around safely in an increasingly digital world and make it easier for them to access online services. The aim of SwissID is to make the issuing of digital identities more efficient and user-friendly. Virtually every single provider has its own identification process at the moment, resulting in high costs. The use of digital identity is simple, secure, and free of charge for private users. It makes business and management processes on the internet more efficient and much simpler. More than four million clients are set to benefit over the next few years. Around 300 opinion leaders, decision-makers, and visionaries from the financial sector as well as the FinTech community met at the "FinTech 2018 – Open Banking: Paradigm Shift" forum staged by "Finanz und Wirtschaft" on March 15 to find out more about the Open Banking of the future, the potential earnings, as well as the disruptive power of digitalization in the financial sector. Credit Suisse supported the event in its capacity as exclusive Premium Partner.